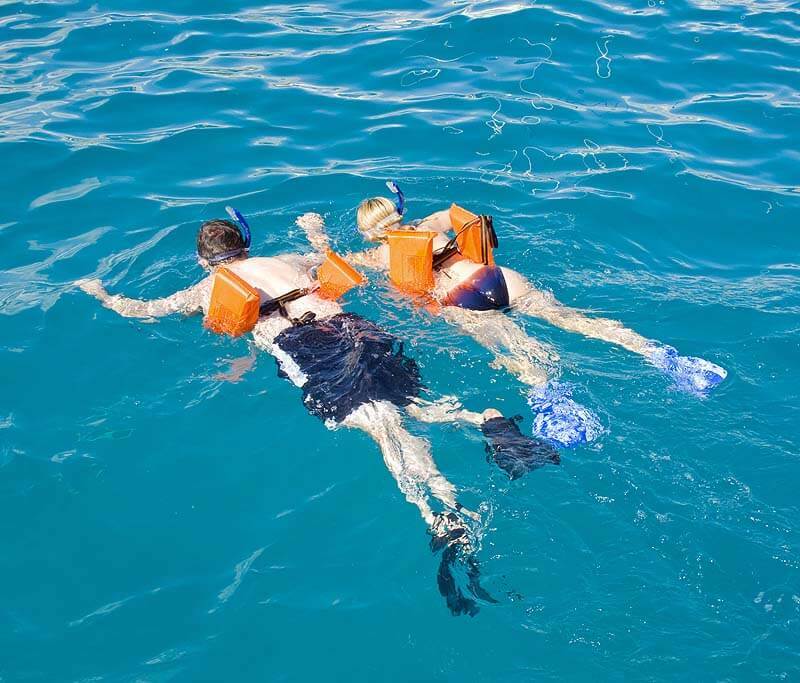 Go snorkeling in Cabo San Lucas with the right attitude, and you’ll have fun! Over the countless visits we’ve made to Los Cabos, we’ve gone snorkeling many times and enjoyed many Cabo snorkeling tours. 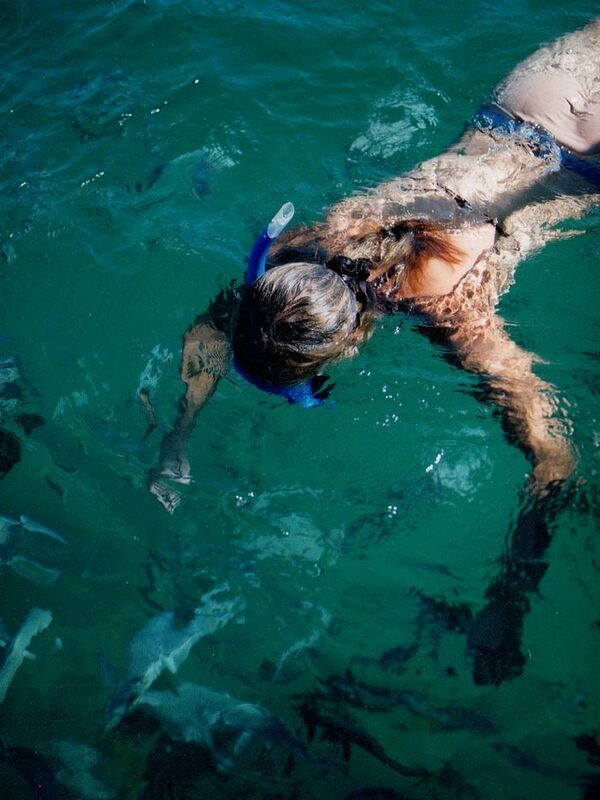 Best time of year to go snorkeling in Cabo? 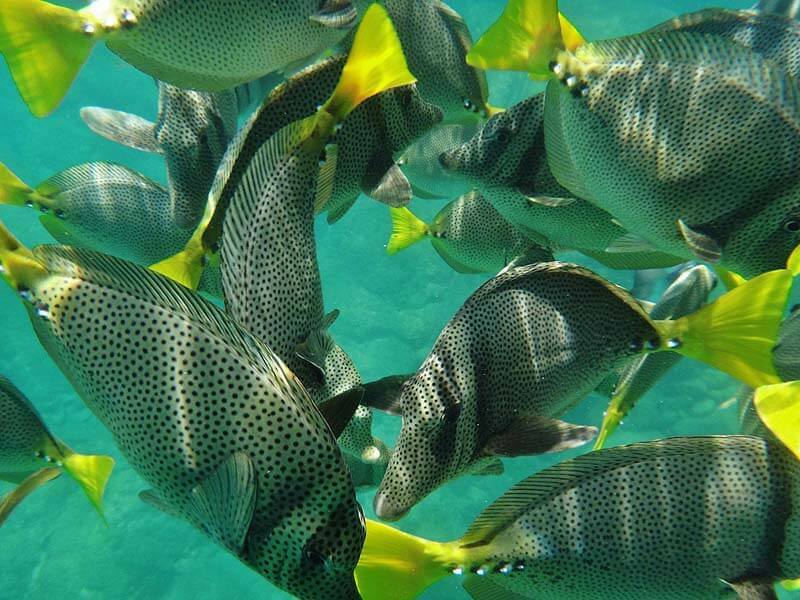 When comparing the snorkeling to other tropical places we’ve explored around the world, we’d say the reefs are more rocky protrusions, rather than the colorful corals of the Caribbean, the Red Sea or Indonesia. And the fish variety is not as diverse as in Hawaii or Thailand. But there are still lots of colorful critters to see underwater. And if you take a baggie of bread with you when you go snorkeling, the fish will be all over you! Keen on Cabo? 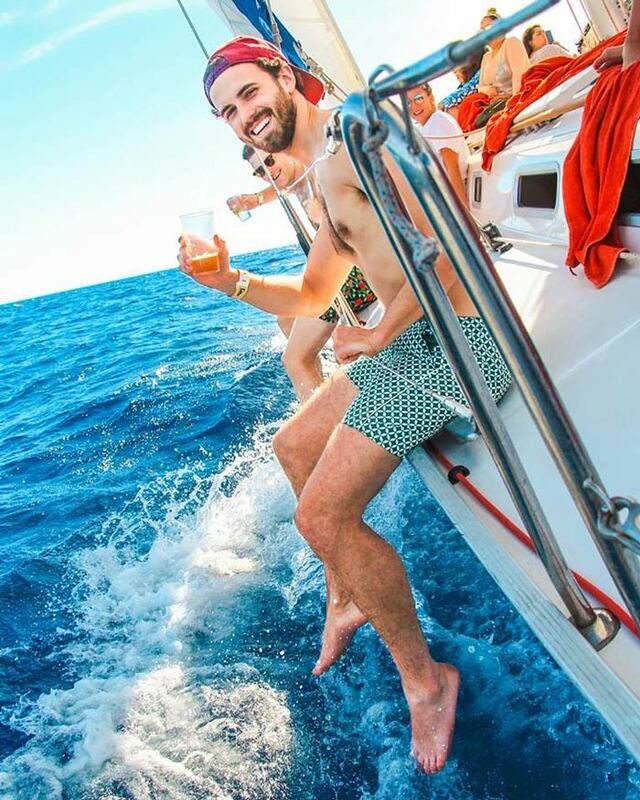 See our epic travel guide on how to have an awesome holiday in Los Cabos! Where to go snorkeling in Cabo San Lucas? Protected from ocean swells, the water is usually calm at Santa Maria Bay. We haven’t spied Captain Nemo here, but clouds of other candy-colored fish are plentiful at this lovely scallop-shaped bay. This spot is on most snorkeling tour boat circuits, but do-it-yourselfers who want to be independent and avoid the snorkeling crowds can also get to Santa Maria Beach by car or bus. This clean, coarse, golden-sand beach is great for both beaching and snorkeling. The public beach offers clean toilets, showers and even a life guard. It’s also on the snorkeling tour boat circuit, so it’s better to get there earlier in the morning than later. Tip: Bring snacks and water, as there are no vendors on the beach. Check out these great swimmable beaches in Cabo San Lucas too! At Land’s End, pelicans love to roost on Pelican Rock (and they have a tendency to poo all over it). But there’s good snorkeling under the water here near the famous rock Arch. The water is clear, and as well as lots of reef fish, you may spot sea cucumbers, sea urchins, sea stars, crabs and sting rays. 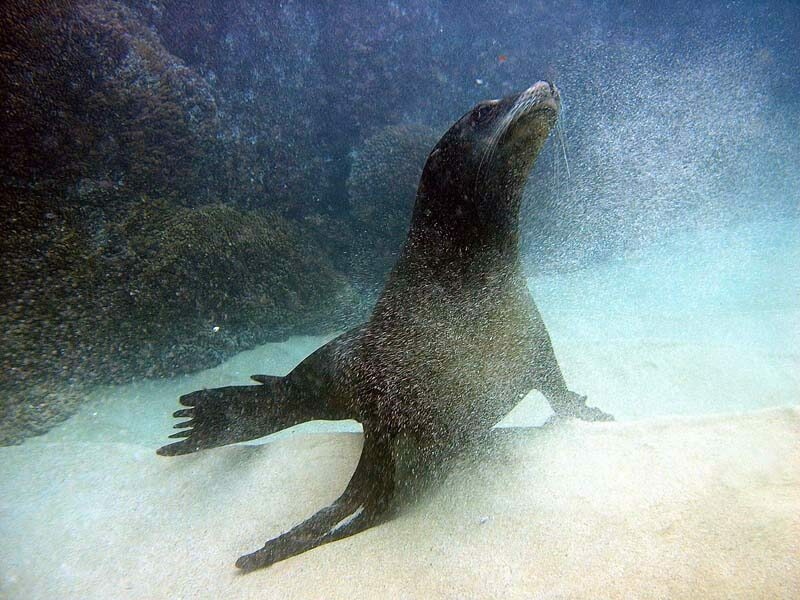 At Land’s End, you might see a sea lion underwater! Another snorkeling site at Land’s End is the tall rocky pinnacle of Neptune’s Finger. It rises up out of the sea between the Arch and Lover’s Beach. There are usually lots of colorful tropical fish here too. 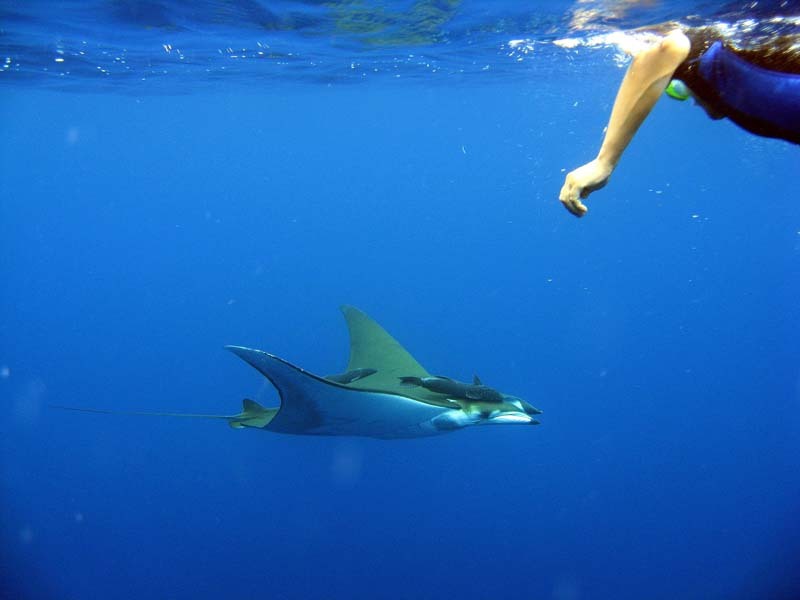 This leading adventure tour operator runs many safe exciting tours in Cabo – often with an eco-learning bent. It’s a good combination; gain an understanding of the Baja environment, and have fun too. 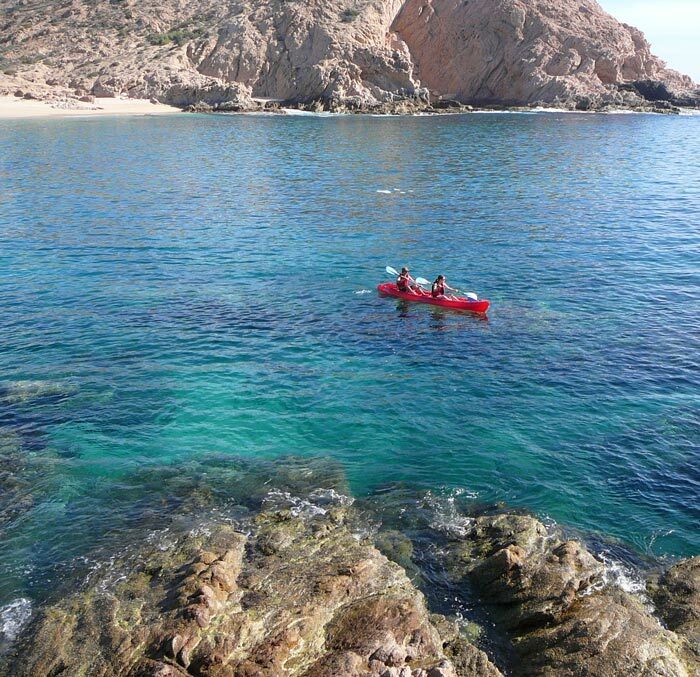 Cabo Outfitters offers fun, nature-oriented snorkeling tours by kayak. 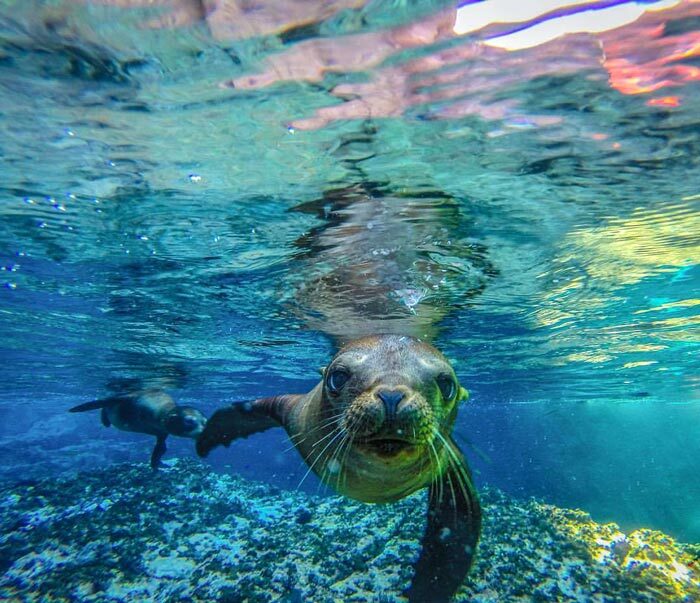 In winter (December to March), their best tour for kayaking and snorkeling in Los Cabos is the “Three Bay” trip. It starts at Twin Dolphin Bay, then you paddle to Santa Maria Beach/Bay and haul out at Chileno Beach. Paddling along the craggy granite cliffs between these Corridor beaches gives you a different perspective of Cabo – it’s quiet. It’s just you and the sun-kissed turquoise sea, with only the occasional seabird swirling and squawking above you. (Okay, there’s your guide, and you paddling partner too if you’re in a double kayak, and the others on your tour – you usually can’t hear them. But you get the point, right? )The kayaking isn’t strenuous (in fact, the distance paddled is fairly short). And at both Santa Maria Bay and Chileno, it’s easy to paddle into shore and hop out. The hard part is donning snorkeling gear so you can find the fish that swim among the rocks! Your guides carry your snorkeling gear with them in their kayaks, and at the beaches, they typically pull out shade umbrellas, snacks and drinks. After snorkeling at Chileno, you’re driven back to your hotel. 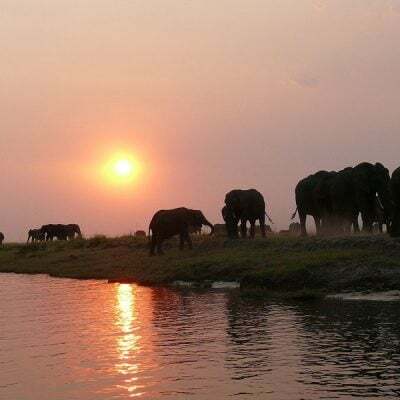 We found this adventure tour company to be highly professional and safety conscious. Guides love what they do and respect the natural environment. In business for more than 15 years, Cabo Expeditions want you to have the time of your life – and feel that you’ve gotten one step closer to nature. You could choose one of the big boats which jam in up to 40 people or more. 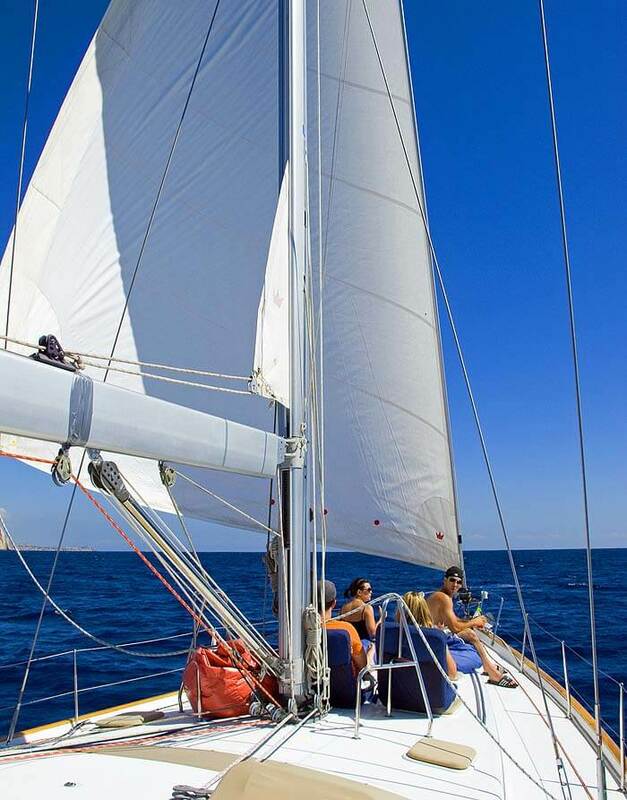 But for a classy sailing and snorkeling experience, we like Day Sail Cabo. “Captain Bob” skippers the beautiful sleek 52-foot sloop “L Attitude 32” – and you actually sail part of the way. 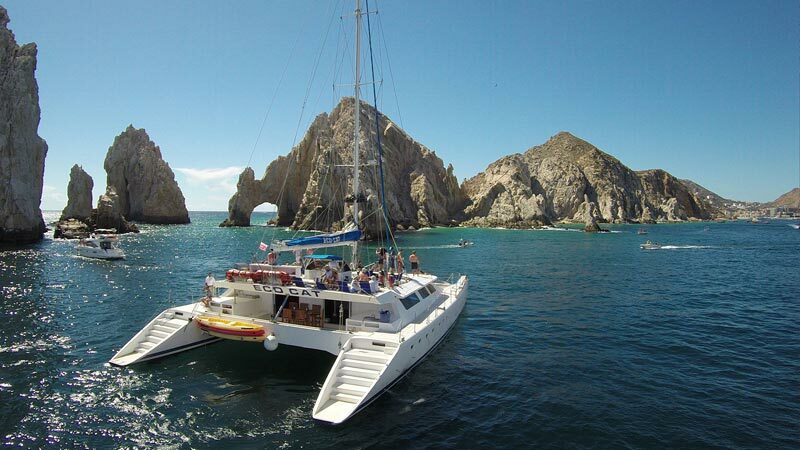 Half-day trips (maximum 12 guests) depart the Cabo San Lucas marina. Cruise past Lover’s Beach and around Land’s End for a peek at Divorce Beach. Perhaps spot humpback whales and bottlenose dolphins. Then sail to Santa Maria Bay while munching on freshly-prepared shrimp ceviche and sipping a beer or margarita. After snorkeling with clouds of yellow butterfly fish and stately parrot fish, enjoy a healthy sandwich lunch, followed by a snooze on puffy beanbags at the bow, as you cruise silently back down the coast to town. Getting ready to jump in! 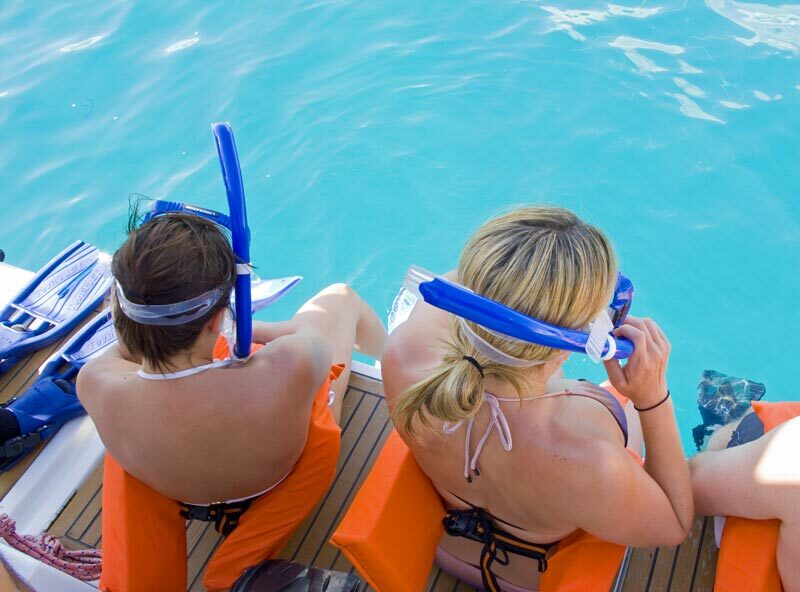 Drinks are included and good new snorkeling equipment is provided. If you’re prone to seasickness, the 2-storey Ecocat is a good choice. Offering afternoon snorkeling tours to Santa Maria Bay, it’s the most stable boat – Cabo’s longest (100 ft) and widest (50 ft) catamaran. Sit inside the huge air-conditioned salon with big windows or up on the bridge deck on lounge chairs. Or sun yourself on the giant trampoline up front. There’s plenty of room for the 150 people she can carry. Beer, sodas, margaritas are included. A full BBQ meal can be purchased as an extra. Wetsuits and towels can be rented. With specially designed, individual seats for 16 thrill-seekers, the EcoToo is a 30-ft, deep-ocean, inflatable speedboat. In summer, the EcoToo speeds off on its “Tres Bahia” tour to all three of the best places to snorkel in Cabo San Lucas (Land’s End, Santa Maria Bay and Chileno Beach). Swim first in fish-filled Chileno Bay, then Santa Maria Bay, before breaking for a barbecue burger lunch and cocktail aboard the EcoCat. After, blast west to Land’s End and Lover’s Beach for your final snorkel stop. Discover the best beaches in Cabo, surf spots and other fun water activities. Read next! 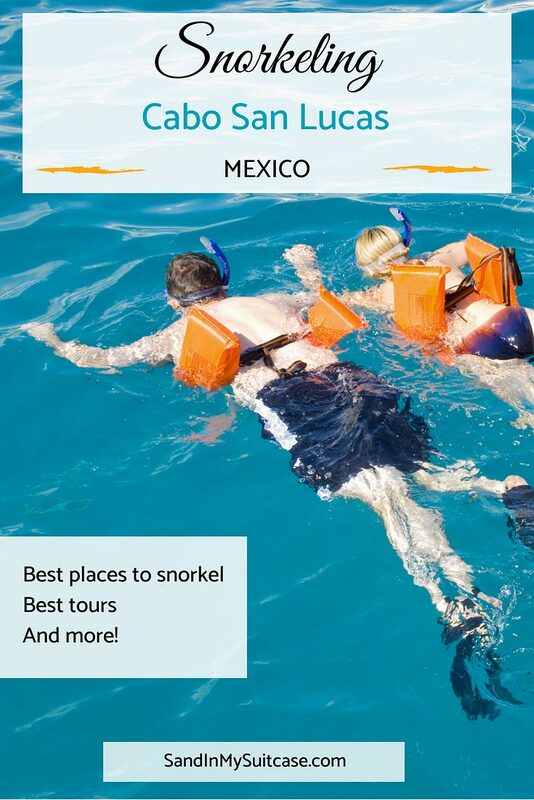 Best time of year to snorkel in Cabo San Lucas? The water temperature is the warmest between October and early December (and the visibility is better too). From January to May, you may find the water a tad chilly for snorkeling unless you have a thin wetsuit. Want to swim with whale sharks in La Paz? 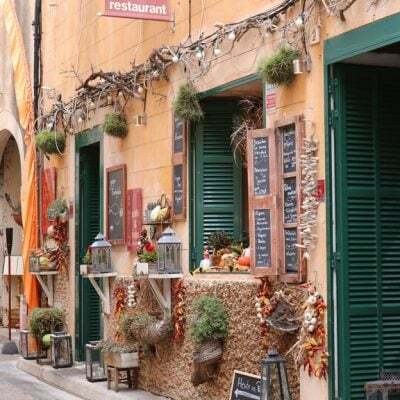 Click here to learn all about it!